Birthstones have existed across cultures throughout history. Often, these were attributed to significant aspects of a particular society, such as religion or custom. Modern times reflect these themes as well, as groups have updated these symbolic stones to reflect current tastes, thoughts, and trends. Join us as we examine the nature of the December birthstones. December babies are super lucky! Of all the months of the year, only a few feature three separate birthstones. December’s birthstones are turquoise, blue zircon, and tanzanite. 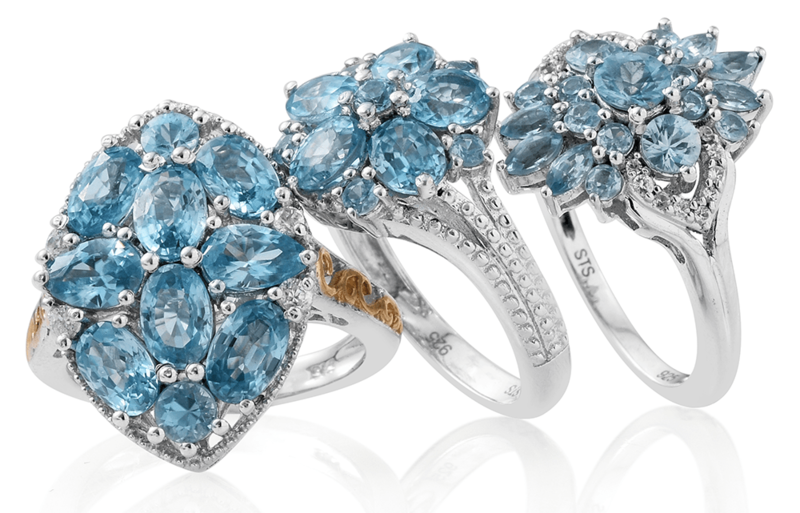 Evocative of the cold winter month, it should be no surprise that all three of these gemstones exhibit various tones and hues of blue. Initially, at the turn of the century, the Jeweler’s of America updated the birthstone list. This was intended to standardize the list, which before could be open to many forms of interpretation. Initially, turquoise and lapis lazuli were established as the birthstones for the month of December. Both were selected for the evocative blue hues they present. Over time, this list would evolve. Eventually, lapis lazuli would be dropped in favor of blue zircon in the early 1950’s. In 2002, tanzanite would also come to join turquoise and blue zircon as an official December birthstone. 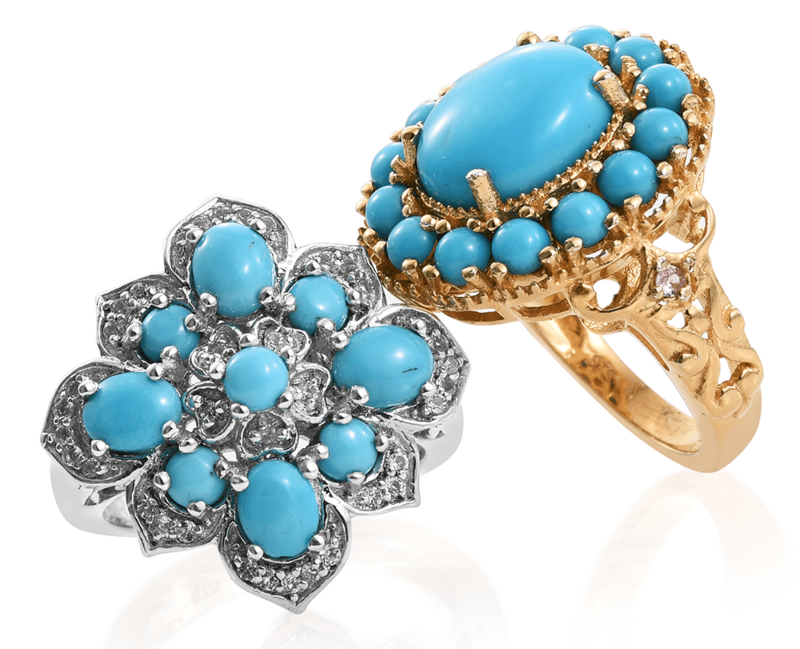 One of the world’s most ancient gems, turquoise has been around for more than 3,000 years ago. The name turquoise originates from the French expression pierre tourques, or “Turkish stone.” The name reflects the fact that the gemstone came from modern day Turkey. This gemstone displays a beautiful blue to green color, sometimes featuring a matrix of its host rock. The national gem of Tibet, turquoise has long been considered a stone that guarantees strength, prosperity, and safeguards from evil. Categorized as per their body colors, there are various varieties of turquoise with distinct characteristics. Mojave turquoise: Cherished for its vibrant variety of colors with a bronze metal matrix. Persian turquoise: Celebrated for its brilliant blues, flecked with a striking mottling pattern. Sleeping Beauty turquoise: No longer actively mined, it’s popular for its cheerful robin’s egg blue color. Sonoran Blue turquoise: Preferred for its beautiful and distinctive blue color with green undertones. Kingman turquoise: Valued for its gentle sky-blue color and light matrix, it’s seen as the primary successor to Sleeping Beauty turquoise. Blue zircon is a brilliant blue gemstone with a higher refractive index compared to any other blue gemstone. Zircon’s name is either derived from the Arabic word “zarkun” meaning red or a combination of the ancient Persian words “zar” meaning gold and “gun” meaning color. Despite this name, zircon occurs in a myriad of colors. This beautiful gemstone is popular for its outstanding brilliance, strong dispersion, or fire, the tendency to split white light into a spectrum of colors. A relatively new gemstone, tanzanite is the blue to violet variety of zoisite. This rare gemstone is only found in one place, the Merelani Foothills of Tanzania. Popular for displaying a transition of color from blue to violet, with flashes of red, tanzanite exhibits pleochroism, meaning that the color of the gemstone shifts as you change its position. Also, this gemstone is believed to boost the immune system, communication skills, and sharpen the mind. 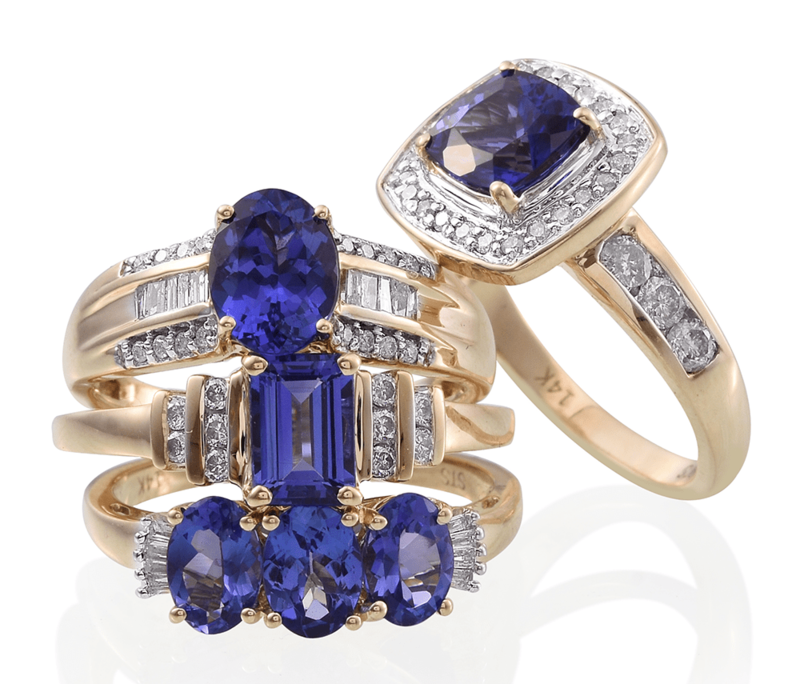 Categorized per their body colors, there are various varieties of tanzanite with distinct characteristics. Bondi Blue Tanzanite: The gemstone is favored for displaying deep blues tinged with rich greens. Natural Green Tanzanite: This gem is cherished for its green base color, with red-violet and blue undertones. Peacock Tanzanite: This gem displays a transition between cheerful green and bright blue hues, mimicking the shimmer of the male Indian peafowl. There are two birthstones historically associated with December. These are bloodstone and ruby. Bloodstone is the lesser known of the two. A variety of jasper, it has a green body color with red flecks, derived from hematite. Bloodstone’s name comes from these red spots, as they are meant to resemble blood. Bloodstone may also be known as heliotrope. The second historical birthstone, ruby, needs little introduction. One of the traditional precious stones, ruby, has long been popular as a gem. While ruby was the traditional December birthstone, it is currently the modern birthstone for July. A variety of corundum, ruby, and sapphire are from the same family. In the United States, there is a distinction between pink sapphire and ruby. Elsewhere in the world, however, they can be both be considered rubies. Turquoise, blue zircon, and tanzanite are considered the modern U.S. birthstones. The United Kingdom only recognizes turquoise and tanzanite as birthstones. Sagittarius (11/22-12/21) utilizes topaz as their stone. Capricorn (12/22-1/21) is assigned ruby as a birthstone. Bloodstone and ruby are historical December birthstones. Birthstones were often thought to bestow luck on the wearer. They continue to be an excellent gift for lovers of jewelry and mementos. Whether you prefer traditional or modern sensibilities, birthstones are a unique way to tell a story about yourself. Which would you choose?